These have become a popular item in Sam's portfolio--reasonably priced (usually around $65.00), easy to customize and entirely functional. If you can draw it, he can probably make it. 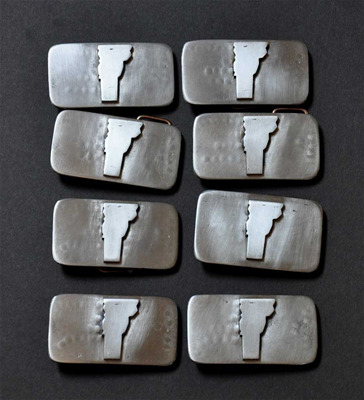 The Vermont buckles are the most popular, but Sam has had requests for the state of Maine,New York,MIchigan, New Hampshire and many others, chainsaws, turkeys, wolves, etc. Each buckle is signed and stamped on the back with the customer's (or recipient's) name. You can see more pictures over at my blog, or on Sam's page on facebook, 'sam mosheim metalwork'.